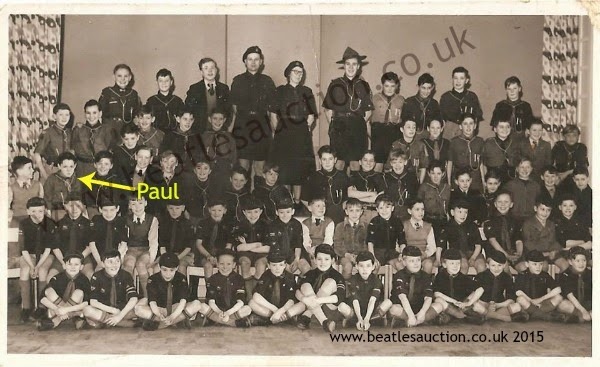 Paul McCartney Was A Cheeky Young Scout! There's a lot of interest in the lives of the four lads from Liverpool before they became fab. School photos and other related paraphernalia are hugely collectable, as we've seen before in our auctions. 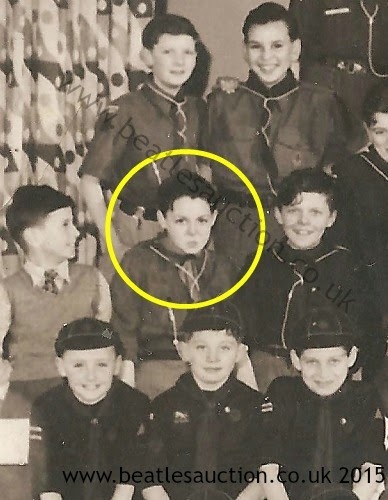 This childhood photograph of Paul McCartney with his Scout troop shows that he's always been a bit cheeky for the cameras. The image is not sold with any kind of copyright and is therefore for private use only. The 2015 Liverpool Beatles Memorabilia Auction takes place on 29th August 2015 at the Paul McCartney Auditorium at The Liverpool Institute for the Performing Arts. Items are being taken in for this year's event at The Beatles Shop on Mathew Street. Please check the contact page for details of how to get in touch with us regarding valuations of any items you may have and the availability of our valuer. All valuations are free. 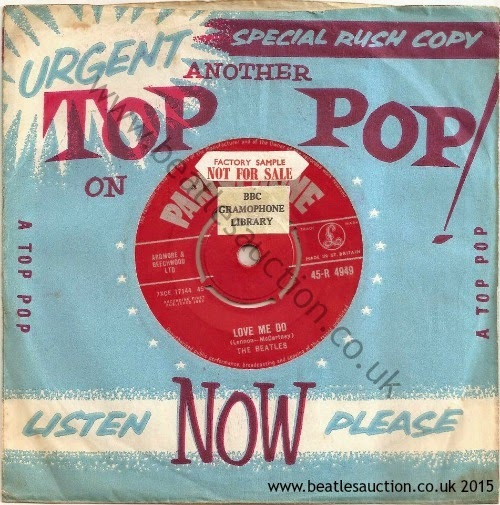 This is currently my favourite item in our 2015 Annual Liverpool Beatles Memorabilia Auction! This pretty red ribbon and white lace garter features a small black and white picture of the Beatles. 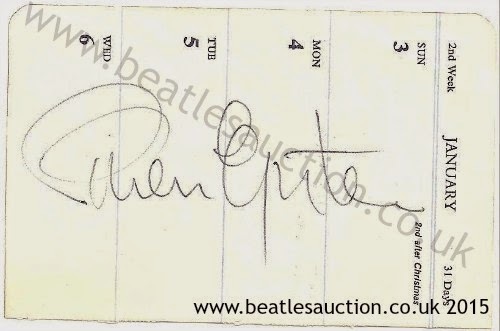 It would make an interesting addition to any Beatles collection and is estimated to fetch between £50-£60 in our Auction in August, so quite a good price for someone just beginning their collection. For more information on lots as they are taken into the auction please bookmark this page or add the feed to an RSS reader of your choice as we will be making posts throughout the year. This diary page signed by the Beatles' manager Brian Epstein is up for sale in our 2015 Annual Liverpool Beatles Memorabilia Auction. By the time this promotional postcard goes up for sale in our 2015 Annual Liverpool Beatles Memorabilia Auction at the end of August it will a little over 50 years old! 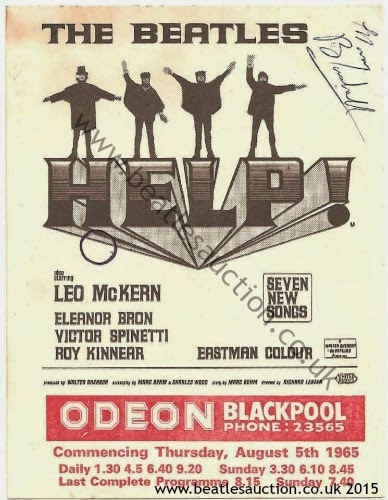 The card is to advertise the showing of the Beatles second film at the Odeon Cinema in Blackpool starting from 5th August 1965. This item is up for sale in our 2015 Liverpool Beatles Memorabilia Auction, held over the International Beatle Week Festival in August each year. Love Me Do BBC Gramophone library copy with "factory sample NOT FOR RESALE" on label, complete with rare "Top Pop" sleeve. We have already started to take in items for this year's auction, and over the next few days we'll be posting about them here. If you have an item that you want us to value please get in touch. Remember that the only person who will be able to give valuations is Stephen and he is hardly ever in on a Friday. It's probably best if you give us a call before coming in with anything because we can then let you know if Stephen is available and sometimes we can give valuations over the phone or email. If you are ringing us about an item please have the item to hand, often there are small differences (usually with records) that can drastically affect the prices. We never value autographs without seeing them first, not even "ballpark" figures. You can email us pictures of items too (including autographs), please make sure the scans/photographs are clear and of a reasonable size for us to look at them. Our contact details are available by clicking here.